It's week two of the January Whole30 and I'm actually feeling pretty dang good. However, it's also less than two months until our wedding. What!? Of course it was our choice to go for a 6-month engagement and "make it happen", but there's something about these last couple of months to go that have me feeling just a little frantic. But at the end of each day, I remind myself: the big stuff is taken care of, no matter what the show will go on & I'm sure everyone will enjoy themselves, our venue is so beautiful, and most important... I walk away with my husband and the start of the real adventure! So it's a no-lose situation. Whole30 during a busy time has actually been perfect, and really what I've needed. Because as much as I feel like I've mastered my "food freedom", I also know my triggers. Stress is one of them. When we are busy and going and have barely enough time to sleep and get basic stuff done around the house, eating out is all too easy. And while I don't find myself over-eating when we get takeout, it's just not the best. It makes me feel less than great, no matter where we order from and how Paleo-ish we make it, and that feeling always turns into added stress on my body & mind and contributes to the vicious downward spiral of wellbeing. So this round I'm feeling grateful for rules & structure around my eating, and also for the PEOPLE out there (you) who have me feeling extra super motivated to keep on keeping on with the Whole30 and sharing as I go. It's been so much fun connecting with you all- at all different stages of Whole30ing (newbies, seasoned peeps, just "dabbling" but not all in). It's fun stuff guys. It's why I do the whole blog thing. 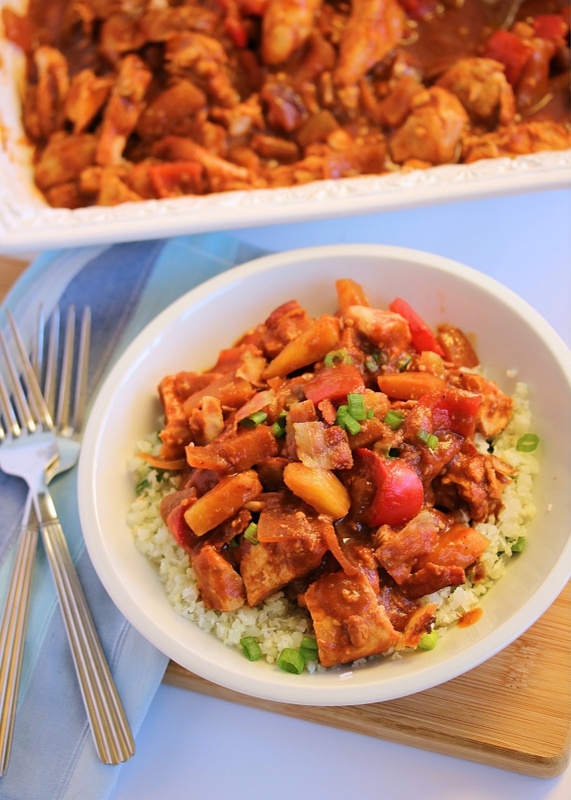 & Speaking of the blog thing: that's kind of why I'm here... because I've got a new recipe! It's actually one I made a while back and have been secretly enjoying because other things made it to the blog first. So needless to say, I'm excited to finally get it out there and share it with you guys! These bowls were inspired by Hawaiian BBQ flavors and a takeout place near us that makes awesome salads and bowls. 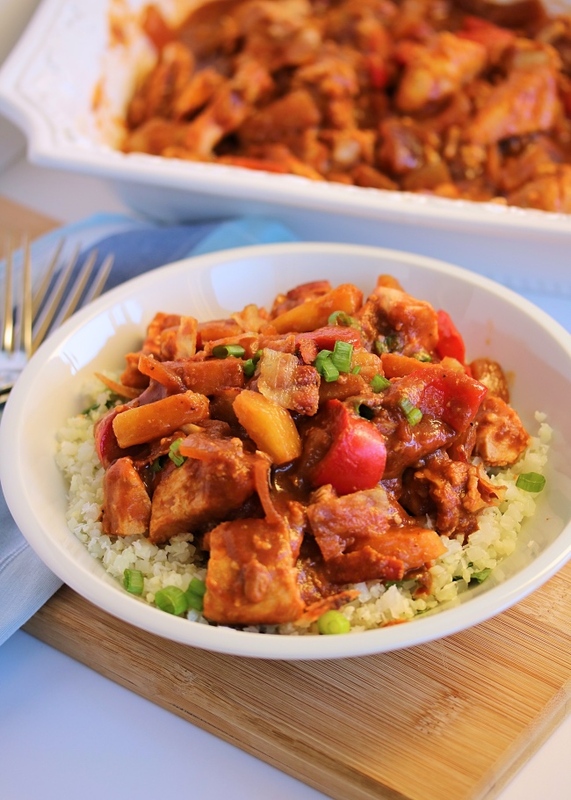 I decided to take my Whole30 compliant BBQ sauce (it's easy I swear) and put it to work in the slow cooker with some chunks of chicken & veggies and some pineapple for a little tropical flair. Over some cauli rice, it's that awesome savory-sweet that is so satisfying, especially with some crispy bacon & fresh green onion on top. 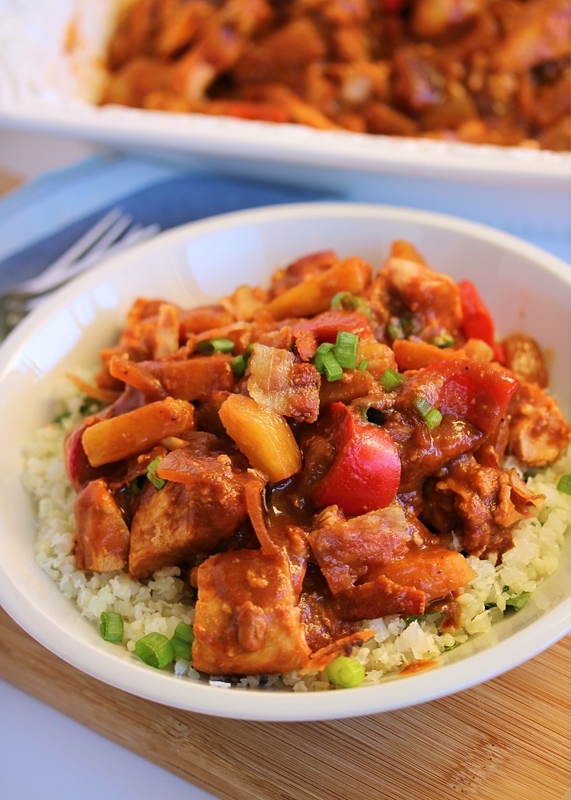 To a slow cooker, add the chicken, BBQ sauce, pineapple, onion, bell pepper, and garlic. Cook for 6 hours on "Low". Steam the cauliflower rice in a saucepan on the stovetop or in the microwave for a couple of minutes at a time until warmed through and softened. 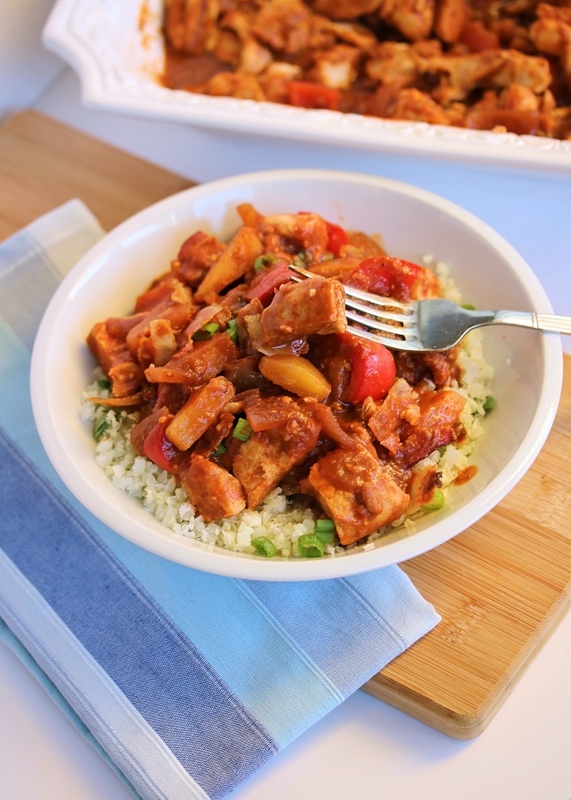 Scoop the Hawaiian BBQ Chicken mixture over the steamed cauliflower rice, and top with chopped bacon & sliced green onion. To the instant pot, add the chicken, BBQ sauce, onion, bell pepper, and garlic. Allow it to natural pressure release for 10 minutes, then release the remaining steam if needed and remove the lid. Stir in the pineapple chunks and set to keep warm until the mixture is heated through. I love this over cauliflower rice, but it's an easy one to switch up if you're feeding others who do eat grains - just sub white rice. If you don't want to make your own BBQ sauce, find a compliant one in a local store, or try one like this from Amazon. I am eating this right now. Right this second. It's my second favorite Whole30 recipe of all time. It's everything you want in a dish. Filling, sweet, savory, textured, healthy, easy to make, soooo good! The BBQ sauce is everything. Best ever. Thank you! I made this-do you leave the juice on the pineapple? I’m wondering if I messed up and it’s overcooked or what I did. 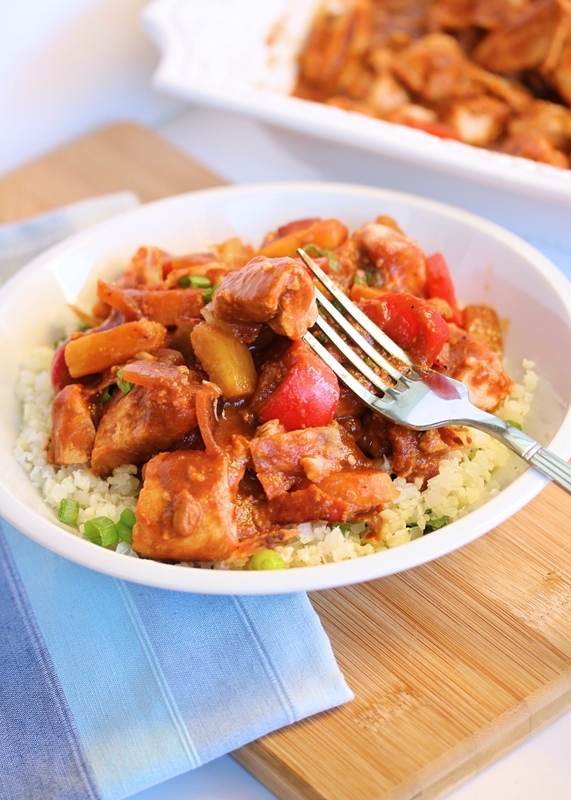 I am looking the recipe something like Hawaiian BBQ Chicken Bowls Paleo and found it here. This recipe with the ingredients are so great and I love to read in detail about this. I always try to have the best recipes like this. This is a great place organize an event; they have great staff and great events put on here! I had nothing but great times and great conversations at event venue Atlanta here. They served slider and shrimp cakes as appetizers with chicken skewers, and eggrolls that had veggies on the inside and some kind of creamy fruit sauce on top.